Today is my birthday. I know I've been celebrating this day like mad since last Friday, but I have continued the celebrating through today. I started off my day with a visit to Starbucks. 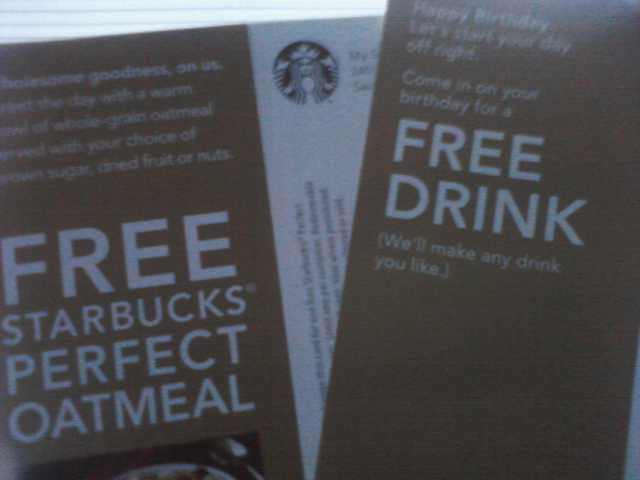 One of the awesome benefits of being a gold card member is that I get a free drink on my birthday. The card actually came last week sometime, but I held strong and waited until today to use it. I also received a free Starbucks Perfect Oatmeal as well. Of course I saved that one as well and used both this morning. A fabulous way to start off the day. Mocha Frappucino Light. Yum! I sucked this down so fast but not as fast as the oatmeal I scarfed down! Then one of the fine ladies I share my classroom with came in with a Chocolate Raspberry Torte from Wild Oats bakery. Oh my. 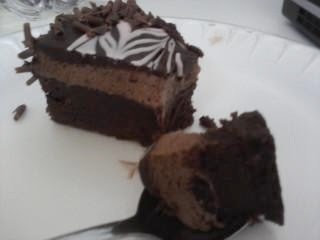 Such a decadent dessert. Of course I had to take pictures of this little piece of heaven and send it to my sister-in-law, Jill, and friend, Stacy, who are participating in One Mom In Maine's Clean Food Challenge. I wanted to do the challenge, but then I wouldn't be able to indulge like I have for my birthday. Next time, Emilie. I also found out that I won, not one, but TWO giveaways today. 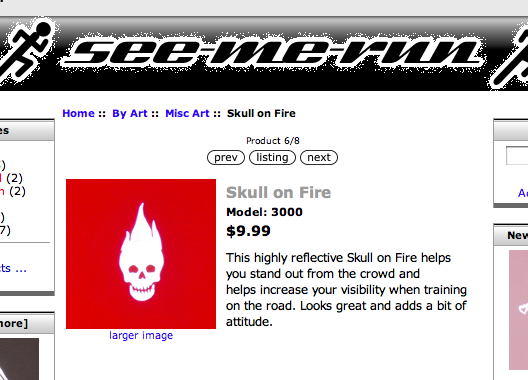 First off, I won Amy's giveaway for a See-Me-Run iron on decal that is reflective. 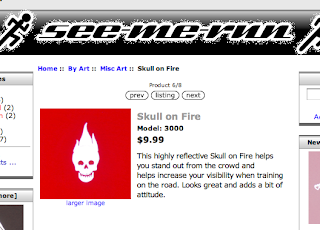 After much discussion with Ward and obsessing with the site, I've decided to go with the Skull on Fire iron on. I think it will go nicely with my badass socks. I'm still not sure what I'll be ironing this onto. But I do have time. I might also share with the hubby as well, since there are two iron ons in the package. Maybe. If he's nice. 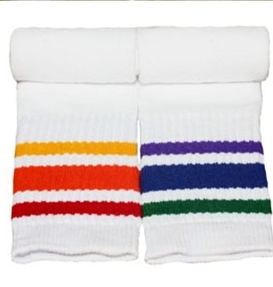 I also found out that I won Penny's Pride Socks giveaway. I know for sure I want knee high socks, but I just don't know! These are fun. Actually all of their socks are fun - that's why it's so hard to decide! You should check them out. What socks would you get? And I need to add in that I did get in a daylight 5 miler and Ward made dinner - my absolute favorite meal ever - pizza. What a sweetie. How was your day? Did you do anything special? Were you able to get in a run? Happy Birthday - looks like a great day! Happy Birthday!!! I definitely cashed in my free Starbucks drink on my birthday a couple weeks ago! Yum!!! Loveeee free Starbucks!! I love orange so will totally recommend those. I always get the Starbucks oatmeal at the airport when I travel. It's a good price for what you get, that's for sure. And I think you should celebrate your birthday through the coming weekend! Happy Birthday!I always have pizza on my birthday too, it's a tradition. I'm so glad that you enjoyed your birthday! That was a little mean of you to send the photo though, haha! I did much better on the Clean Food Challenge yesterday and Mike and I did a hill workout! Sounds like it was a great birthday!! Happy Belated 35! Happy birthday, sounds like it was perfect! So sorry this is belated. I am glad you had such a great birthday! Happy Birthday! 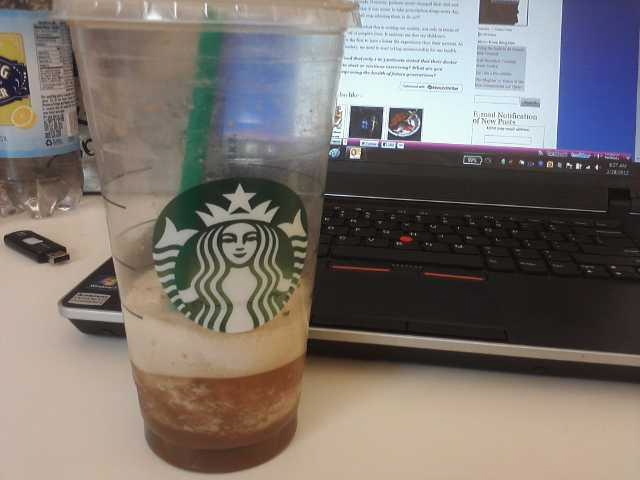 Starbucks is definitely a great way to treat yourself! Glad you had such a wonderful birthday! That dessert looks absolutely wonderful!